Horror fans love genre themed t-shirts as a way to show of their affection for some of the most beloved films ever made. Since we all love Friday The 13th here, it's fun to promote and inform our readers when a new design is available that may interest them. Today we have a pretty rockin' shirt designed by Mark James Hiblen. The tee can be purchased on Situation Normal and is shipped from the U.K. 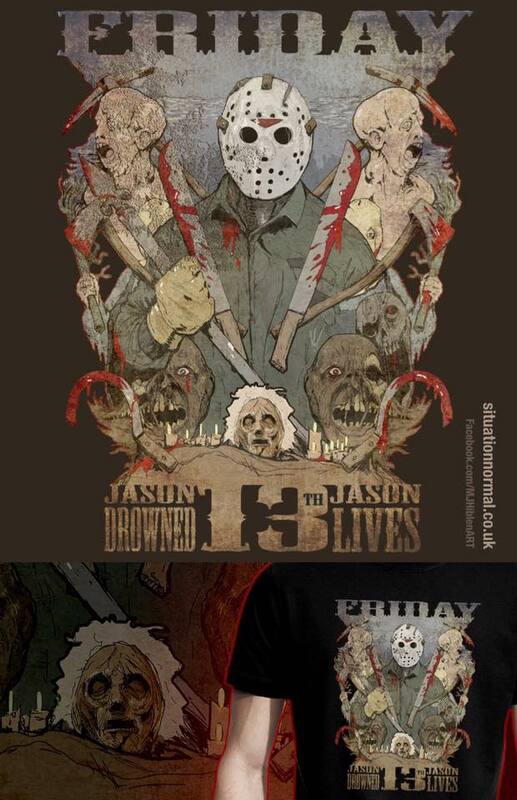 The design is fun and sports the phrase Jason Drowned and Jason Lives with fun references to the original film and Friday The 13th Part 6 with imagery littered among illustration from films in-between. This shirt is a full colour DTG Print that is made of 100% combed cotton 165g Fabric laundered for soft hand feel. What are your thoughts on this tee?